School psychologists are in an ideal position to make a difference in the lives of students, meeting them in the environments where they spend much of their time. Armed with a solid understanding of youth’s developmental stages and the challenges they may face, school psychologists work not only with students themselves, but with parents, teacher and administrators, to help students succeed. 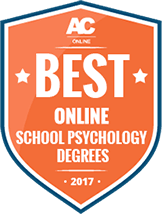 Get started on the path to becoming a school psychologist by learning about the various online degrees available. School psychologists work with children in a school setting, helping them to work through challenges both at home and at school. Using their knowledge of child development and brain development, they can set plans of action so parents and teachers can help too. An online degree in the field is the first step in a career in school psychology and impacting the lives of children for the better. The University of Northern Colorado offers two school psychology degree programs that have been approved by the National Association of School Psychologists: an Ed.S. and a Ph.D. Students who enroll in the Ed.S. program receive the training they need to become school psychologist practitioners. Coursework focuses on the emotional, social, and intellectual development of children; academic interventions; and programs that promote safe learning environments. The Ph.D. program is designed for students who want to conduct research or provide consulting services to schools and community organizations. Coursework covers topics such as interventions for students with low or severe disabilities, the biological bases of behavior, social cognitive neuroscience, school-based psychological consultation, and applied behavior analysis. Eastern Michigan University offers an educational psychology master’s degree program that trains students to apply psychological principles to school and non-school settings, conduct research, and create and administer assessments. Core coursework includes areas such as intelligence theory, motivation, gifted students, multicultural learning, and the sociology of education. People can also choose to concentrate their studies on how students develop academically or on research and assessment practices. In addition, the school requires a thesis and project that allow students to demonstrate their understanding of class material. Graduates from the program have gone on to work as teachers, assessment specialists, business trainers, and researchers. The University of Utah has a psychology department staffed with faculty members that have various interests including behavioral assessments, early childhood interventions, autism spectrum disorder, parent training, telehealth, and diversity issues. As a result, whether students want to work in schools or human services agencies, they can benefit from professionals that provide a comprehensive view of the educational psychology field. Those in the school’s master’s degree program are required to complete 73 semester hours of coursework and a supervised internship of 1,500 hours, while doctoral students must take 108 hours of classes and complete a 2,000 hour internship. Based on the scientist-practitioner model, Temple University’s school psychology degree programs give students the psychological foundation they need to effectively handle the demands of this challenging profession. The school’s Ed.S. degree prepares students to apply evidence-based practices in school settings when using assessments, performing interventions, working with school administrators and parents, and teaching diverse student populations. Those who earn a Ph.D. in school psychology from Temple University learn how to conduct research and assessments, as well as provide consulting services. Course requirements include topics such as tests and measurements, applied behavioral analysis, cognitive assessments, personality and behavior, and psychotherapy. Texas A & M University’s school psychology degree program gives students the skills and knowledge they need to create and administer assessments, conduct research, and provide interventions to students. After completing the program, graduates can pursue jobs in public and private schools, hospitals, colleges and universities, health education organizations, and medical clinics. Required coursework includes classes about intelligence, emotional disturbances in children, advanced therapy techniques, and school behavioral problems. In addition, students receive extensive practical experience by working for two semesters in a community clinic and 600 hours in a school setting, as well as completing an assessment practicum and research apprenticeship. Offered through Teachers College, Ball State University’s school psychology degree program combines classroom and field work to give students the competencies they need to do interventions, assessments, and consultations in education settings. Required courses in the program explore topics such as psychological consultation, statistical research methods, personality assessments, and developmental pathology. In addition, students can take several electives in areas like exceptional children, counseling processes, abnormal psychology, measurement theory, psychopathology, and physiological psychology. In order to provide practical experience to students, Ball State University offers internships in regular and special education settings, as well as clinical practica. Students who are interested in working in the school psychology field can enroll in the combined MA/EdS degree program at the University of Memphis, which can be completed in three years. After completing the program, students are qualified to receive credentials from the Tennessee State Board of Education, or from certification board in other states. The program focuses on several domains of the field, including data-based decision making, consultation, collaborations, research, ethical practice, and instructional support. The school also offers a doctoral degree that emphasizes research design and statistics. Students in this program take courses in research methodologies, behavioral neuroscience, psychoeducational assessments, and child psychopathology. Through the Department of Educational Psychology at the University of Georgia, students are able to complete their master’s degree in the field, which may prepare them to enter or advance a profession in educational psychology. The program is comprised of a sequence of courses that cover necessary information such as human development, learning and motivation strategies, and quantitative methods in various areas of focus. With a research-focused program, students can expect to graduate with strong research and analysis skills, which can help them become in a leader in their field. Students interested in studying a career in a school or educational psychology field may benefit from enrolling in the Learning, Cognition, & Development program at Rutgers University-New Brunswick. This program can be completed both online and on-campus, which gives students the flexibility to maintain other time commitments while pursuing their degree. Courses cover topics such as learning strategies and motivation, cognition and memory and educational psychology. Upon graduation, students will receive their Ed.M. degree, which may give them the necessary credentials to succeed in the field. An Educational Specialist (EdS) program is offered at Northern Arizona University, helping to prepare students to work with youth in various academic settings from preschool through high school. This program covers important information such as learning behavior assessments, prevention and intervention. Students are able to graduate once they successfully complete 72 credit-hours of coursework and can typically be completed through three-years of full-time study and a one-academic-year of internship study. The program has received approval status from the National Association of School Psychologists. Through the Department of Educational Psychology at the University of North Texas, students are able to pursue a degree in the field by choosing from over a dozen graduate specializations in educational psychology and/or special education. Areas of focus include emotional-behavioral disorders, family science and learning and development, including programs at the master’s and doctoral level. The school also offers four master’s degrees that can be completed online as well as three online certificate programs that may help students advance their understanding of the field. Postsecondary Education Administrator Oversees student services, faculty and staff members on college and university campuses. $88,390 Master’s or doctoral degree in a related discipline is common, but bachelor’s degree may suffice. Postsecondary Teacher Teaches school psychology and related subjects on the college/university level. $70,790 Doctoral degree, master’s may suffice for community colleges. Several educational paths are open to those who want to become school psychologists. The example below shows a possible path that turned a high school project into a career of helping students in need. Drawn to its convenience and flexibility, students are increasingly choosing online schooling to advance their education without neglecting their other commitments. In addition, as online education matures and becomes even more prevalent, students can be reassured that the quality of education provided is consistent with programs offered in a traditional campus environment. While the format may cause some apprehension to students accustomed to a classroom setting, most programs are structured so that students can reap the benefits of both synchronous and asynchronous learning. Course materials and assignments are usually available for students to access and complete at their convenience, while a number of technologies facilitate interaction with professors and peers to create a collaborative environment. Discussion boards and wikis allow students to work on team projects with their classmates, for example, while live video streaming and chat functions mimic an in-person environment to allow real-time communication and participation. A key component of any school psychology program is the ability to apply classroom knowledge and skills in real-life situations, and most online programs address the hands-on nature of school psychology by integrating internships and on-campus residencies into their curricula. These opportunities ensure that students are exposed to scenarios they will likely encounter in the future, allowing them to gain practical experience and develop their skills. Such components require in-person commitments, of course, so students should plan ahead to work them into their schedules. Several bachelor’s degree majors are acceptable for entrance into a graduate program in school psychology—including child development, education and social work—but most future school psychologists pursue a BA or BS in general psychology. Generally speaking, a BA program prepares students for employment directly after graduation or for graduate programs in applied psychology, while BS programs are geared to students interested in pursuing graduate study in science-oriented specializations. In either case, these programs offer a broad overview of the field, allowing students to explore a range of specializations before committing to one in graduate school. Degree requirements normally consist of 120 semester credits, including general education courses; mandatory core subject courses; and subject-related electives. Additional requirements, such as laboratory projects, internships or work experience, depend on the specific program. The Ed.S. falls between the master’s and doctoral degree levels, and is ideal for school psychologists in that it incorporates both the classroom coursework associated with a master’s degree and a supervised internship program that is required for certification from the National Association of School Psychologists (NASP). Earning an Ed.S. in School Psychology normally requires three years of full-time study and practice, although there are a few two-year accelerated programs available. Most are formatted to comply with NASP certification requirements and consist of one to two years of classroom work and 1,200 internship hours, although specific requirements vary by program. Additionally, many schools offer a master’s degree (MA or MS) in combination with an Ed.S. degree, awarding a master’s in school psychology upon completion of coursework and prior to beginning the requisite internship. Some programs may require students to pass a state competency/licensure examination following the first year of the program, before moving on to the internship component. Three doctoral-level degrees are offered in school psychology: the Ed.D., Psy.D. and Ph.D., each with its particular requirements and outcome goals. Students typically proceed from a bachelor’s degree to one of the doctorate options without earning a master’s or Ed.S. in the interim. Generally, the Ed.D. is focused more on theory and skills directly related to education; the Psy.D. is directed to those interested in clinical work; and the Ph.D. emphasizes theory, experimentation and research. All three types can lead to becoming school psychologist; however, there are a limited number of online school psychology programs available at the doctoral level, and it will be key to find one that includes the requirements for obtaining national certification and state licensure. In all cases, students will need to complete an extensive internship as part of the program. Acquaints students with the history and field of school psychology, as well as with contemporary trends and issues in the profession. Examines major theories of individual counseling and their application for school counselors and psychologists, with a focus on both theoretical knowledge and practical skills. Issues of social and cultural diversity are discussed. Introduction to collaborative consultation leadership techniques and models such as communication, diplomacy and interpersonal skills, which are necessary for effective consultation at the individual, group and system levels. Looks at human brain functions and their relationship to memory, intelligence, speech, spatial abilities, judgment, reasoning and more. Individual differences in brain functioning in both normal and brain-damaged persons is considered. Discusses assessment techniques with a problem-solving approach, emphasizing training in interviewing, observing and testing children and adolescents. Program Content and Structure: Determine which programs best suit your individual needs, interests and career goals, as well as which are formatted to accommodate your schedule. Admission Requirements: Review the specific admission requirements for each online program. Some schools require a minimum GPA or specific course prerequisites, for example; it may also be necessary to take the Graduate Record Examination (GRE) and possibly the GRE psychology subject test. Cost: Be aware of all costs involved, including tuition, fees, books and course materials, as well as travel and related expenses that may arise due to in-person requirements. Financial Aid: Determine what financial aid options are offered through the online school, such as grants or scholarships, as well as through federal funding. Support Services: Check what school services are extended to online students, such as career and financial aid counseling, academic advising, technical support, library privileges and internship placement assistance. Accreditation: Confirm that a program is fully accredited and includes all necessary requirements to obtain state licensure and national certification as a school psychologist. Learn more about accreditation for online school psychology programs below. Institutional accreditation is the responsibility of a system of regional accrediting agencies recognized by the U.S. Department of Education. The American Psychological Association (APA) is a primary accreditor of doctoral degree programs in all areas of psychology; however, it should be noted that due to the practical experience required for these degrees, the organization does not accredit programs that are offered entirely online, although it does accredit hybrid programs with online and on-campus learning elements. The Council for the Accreditation of Educator Preparation (CAEP) also provides program accreditation, based in part on reviews provided by the National Association of School Psychologists (NASP). Decide which programs you wish to apply to. Take the GRE, if required. Submit requests for undergraduate transcripts to be sent to prospective programs. Request letters of recommendation from professors and colleagues. Submit applications and any other requested documentation. File the Free Application for Federal Student Aid (FAFSA) application and other required documents. Accept offer of your choice. Decline all others. Establish relationships Get to know undergraduate professors who can write strong, personalized letters of recommendation to send to graduate programs. Do research Find opportunities to be a research assistant. It’s ideal to get exposure to multiple areas of psychology to gain an overall perspective, but also to find a specialty area to demonstrate specific interest to an admissions committee. Do fieldwork Work for or volunteer with an organization, preferably one that serves children, to gain valuable experience. Network Join a student group dedicated to psychology students; this shows commitment to the field and is key to begin to establish professional connections. In addition to state licensure, which is required of all school psychologists, there are a variety of professional certifications they can obtain to further demonstrate their skills and experience. Every state requires licensure of some form for the professional practice of school psychology. In many cases, state credentialing requirements closely follow those for the NCSP national certification. Specific qualifications vary from state to state, however, so candidates should familiarize themselves with individual standards before enrolling in a school psychology degree program. For more information, visit the National Association of Schools Psychologists website for state credentialing requirements. Awarded by the National Association of School Psychologists (NASP), the NCSP is arguably the most important of all certifications in the profession, as many states model their licensure requirements to correspond with NCSP certification standards. Additionally, most Ed.S. and Ed.D. degree program internships are designed to satisfy NCSP internship requirements and, in turn, state licensure requirements. To learn more, visit the National Association of Schools Psychologists page on NCSP eligibility. The School Psychology Specialist certification is administered by the American Board of School Psychology (ABSP), a division of the American Board of Professional Psychology (ABPP). Requirements for this certification include completion of a doctoral program in the field, extensive internship and postdoctoral practice experience, and passing the certification examination. More information is available at the ABPP page on the School Psychology specialty. Clinical psychology refers to the broad practice of assessing and treating mental illness, abnormal behavior, and psychiatric problems of patients individually and in relation to their families and communities. Clinical psychology degree programs are available on all degree levels, with numerous online options. Similar to school psychology, child psychology focuses on the overall psychological needs of children and adolescents in relation to family and other social contexts. Online programs offer degrees in child psychology, developmental psychology, infant and early childhood development, and clinical psychology with concentrations in child psychology. Forensic psychology is the practice of psychology within the legal field. Forensic psychology is growing in popularity, resulting in an explosion of postsecondary degree programs, including several online. Forensic psychology may be offered as its own major, or as a concentration within a more general psychology degree.